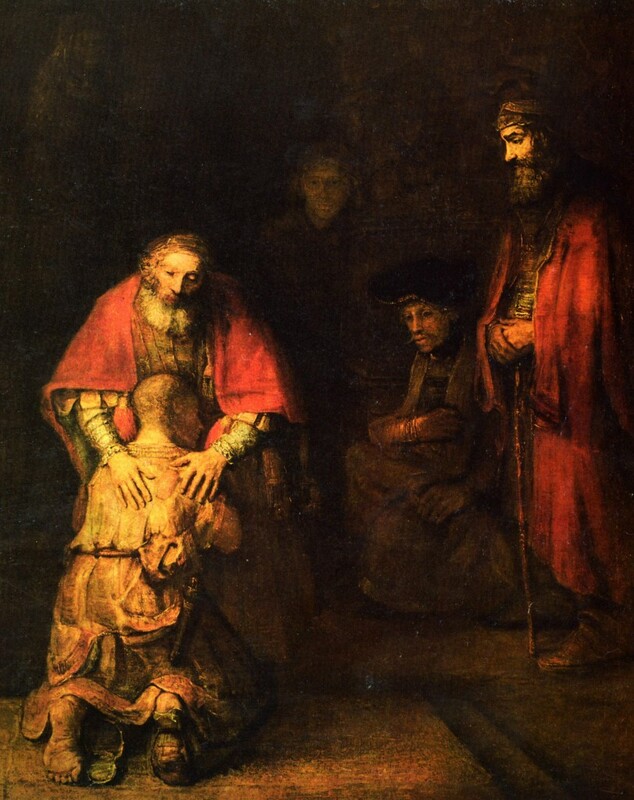 Michael Morris, philosopher, on Rembrandt’s ‘Return of the Prodigal Son’. MM I think I need to explain exactly what I’ve chosen. It’s not exactly the painting, it’s the gesture in the painting. It’s the gesture of the hands. It’s not a gesture that you might come across in the street or the home: it’s a gesture that’s essentially worked in the paint and the composition. It’s an astonishing piece of painting, but to me it’s also an interesting example of quite a common feature of beauty in representational art and I think it offers a kind of metaphor for the way that feature works. GB Explain to me what this represents. MM It’s all to do with the way this gesture is worked throughout the whole painting. The direction of the light on the son’s back, falling across the father’s hands, gives Rembrandt an excuse for outlining the fingers – which he’s done not naturalistically, but traced with a brush along the line of the fingers. That disrupts a naturalistic sense of the depth of the represented space and that means that the hands sit there very lightly, almost hovering. That lightness of touch is also in the very gentle stoop of the father and the figure on the right then brings in the angle to show, but in an almost unstated way, the direction of the pressure of the father’s left hand. The key thing is that tentativeness, that delicacy – almost a hesitancy of the touch. For some reason it’s quite characteristic of the things that we call beautiful in representational art, but it’s not to be found – perhaps it’s not even intelligible – in natural beauty, beauty in things that don’t strike us as being designed. It’s a bit like a lot of great slow movements in music: the beauty here is in the tentativeness and tenderness that’s carried in the way the hands are painted in the context of the whole picture. I suppose the puzzle is why that’s what’s beautiful. GB Do you think it’s because it’s something transitory? MM I think that’s part of it. I think what I’d want to say in general is that when we find something beautiful it’s something like affirming that the world can be made sense of – in particular can be made artistic sense of. That’s partly why, when you look at a landscape you want to photograph it. But there’s something odd about that idea in the case of representational art because art already makes sense artistically. So what you need is some sense that the world might resist that, that there might be something difficult. So I guess that the tentativeness in that hand gesture, that’s also in lots of great slow movements in music, is a kind of recognition that life is not simple and yet it can still be made sense of. The delicacy of the touch of the father’s hand is itself a metaphor for this. It’s like a reassuring hand on a sore place – in fact the son’s shirt is torn near the hand, making it seem as though the hand doesn’t want to hurt the shoulder that’s sore underneath. There are lots of pieces of music that reflect this sense of being careful because the hurt is quite deep. GB Would you describe this response to beauty as sensory or emotional or intellectual? MM It can’t really be described like that. It has to involve an appreciation of the relationship between the work and what’s serious about life. I think beauty in representational art most obviously works if it has that. GB It seems to be a response to beauty that requires a certain level of maturity. MM I suppose so, but I remember seeing a black and white photograph of this painting at the age of fifteen and being immediately struck by it. You need to know a little about pain and death but most people do by the time of adolescence. GB Do you think you need to know anything else about the picture to appreciate it? MM I think it helps to look carefully at how it’s painted, to puzzle about how those hands work – that they don’t quite work unless they’re in the context of the whole painting. GB Do you think that the religious story behind it is important? MM It may be to some people but I mostly don’t even think of it. I see it as a father and his son. But it’s difficult to work out exactly who everyone is. If the figure above the father’s left shoulder is the elder son, he has quite a subdued role. I’ve no idea who the large figure on the right is. For me it only helps to know that it’s a son and a father. GB When you saw it for the first time, were you very aware of Rembrandt as being this great master? MM Yes, I’ve been a Rembrandt nut since the age of eight or nine. I used to draw and paint a lot and was mesmerized by the use of paint in the later works. GB If you found out it was a fake would you still love it as much? MM I don’t care whether it’s Rembrandt or not. It’s very hard to imagine that this painting hasn’t been thought through in a way that matters. GB Were you aware of Rembrandt’s own life story (and prodigality) when you saw this? MM I don’t think I was sure about the dating of this painting when I first saw it and I don’t tend to read too much of an artist’s life into their work. GB So it’s the simple humanity of those two figures that touches you? MM It’s the movement and the delicacy of the touch that I would call beautiful. I think the key thing is the contemplation of the difficult things in life and the fact that this offers reassurance. It’s not a hug that the father’s giving the son. It’s almost like a blessing. GB So is it a promise of happiness? MM I’ve thought a lot about that quotation. It’s from Stendhal when he’s trying to explain why a man might prefer his mistress to someone more beautiful. He’s calculated the units of happiness that each might be expected to bring. The idea of a promise is quite good but I think it’s more a reassurance than a promise. It’s more like an affirmation, and not of happiness to come, but rather that things in the world are alright – so providing real grounds for happiness rather than promising something subjective and psychological. It can still be illusory, it might be a kind of lie. But it’s a reassurance about a feature of the world rather than an offer of treats to come for oneself. GB I suppose that also makes the picture successful in terms of the protestant audience it was meant for at the time. MM I think forgiveness is there and is a part of this sense of reassurance. Forgiveness can be seen as a way of dealing with, resolving, the hurt of one’s own failings. But there are great moments of forgiveness in art which don’t have much to do with religion, such as the last moments of Mozart’s Marriage of Figaro. I suppose you could see the old man here as a God figure but I think it’s simpler than that. GB Do you think that anyone could find this beautiful, with no understanding of the religious story or of Dutch Baroque art? MM Yes, I think anyone could find this beautiful. You need to understand the language of the painting a little bit, but I think you can look at how it’s painted and the way those hands lie and that’s enough – though you can enrich that later with knowledge of the iconography and the story. GB Do you think that Rembrandt had some kind of genius for bringing moments like this to life? MM Genius is a tricky word although it is one I’m tempted to use. What an artist has to be able to do is to present something that can be pursued and thought about and re-understood indefinitely. When it works it’s always more than the artist could have intended so there’s something slightly miraculous about deliberately producing something like that. How can you deliberately produce something which means more than you can intend it to mean? But Rembrandt certainly had an extraordinary capacity for doing that. I guess it arose from endless practice and then being happy to let brushstrokes lie as they fell. GB But it’s something more than craftsmanship? MM There’s thoughtful circumspection in the use of the medium, which is at once extraordinarily in control, but also prepared to let things happen a little as they will. With craftsmanship you always have a sense of a clear, pre-determined goal. Great artists will let the medium do its bit too. MM I’m tempted to say that what makes one call something beautiful is that it affirms a sense of the possibility of making sense of the world. Then whether something is really worthy of the term depends on whether the world really can be made sense of. I’m optimistic about that. It’s like the idea of a life having a shape. It’s about facing up to the complexities of the world, and still finding it makes sense.